Yes, it's that time of year when we need to fend off high winds and rain on venturing outdoors, so here at the Studio we have been putting the Mountain Hardwear StretchDown insulated jacket ($340/ £220) through its paces to see how it performs. We have the men's non-hooded version of this Mountain Hardwear jacket, but similar versions are available with hoods, and also styled for women. The jacket is exceptionally lightweight and not at all bulky, with the outer shell material made of 100% polyester and the lining 100% nylon. The down filling is held in place via welded (not stitched) channels and this produces the useful stretch technology within the product that makes general movability, generous. Mountain Hardwear have produced a very stylish jacket and the design includes three exterior zipped pockets and two interior open pockets. The welded channels are all carefully aligned and all stitching is fine and also well-aligned. The main zips and pocket zips are strong and there are adjustable elasticated pull-strings for tightening the bottom of the jacket so that it fits snugly below the waist. As soon we put this jacket on we were amazed how lightweight it is but, even so, within seconds it also begins to warm you. It is a well-fitted jacket that feels good to wear because it stretches with you as you move around - something appreciated by us whether we are on long rambling hillside walks or simply out and about shopping. This does definitely make a difference and stops the jacket feeling tight or cumbersome to wear. In addition to this, we've found the trademark StretchDown insulated technology excellent against the Autumn, near 60mph, stormy winds that have started to blow - the wind is kept out and the jacket keeps us snugly warm. It is also a great rain barrier, with the droplets immediately bouncing off the waterproof material; but the hooded version would obviously give more protection in this regard if needed. As well as the very comfortable, lightweight and snug feel of this jacket it has other amazing features - the pockets are all vast! For such a stylish and well-fitted jacket we would not have anticipated such a great amount of storage space. The two outside zipped pockets extend to the outer seams of the jacket and likewise the top chest zipped pocket is a good size. The two open inner pockets on each side also extend right down to the bottom seam (poacher-like), making them truly capacious. 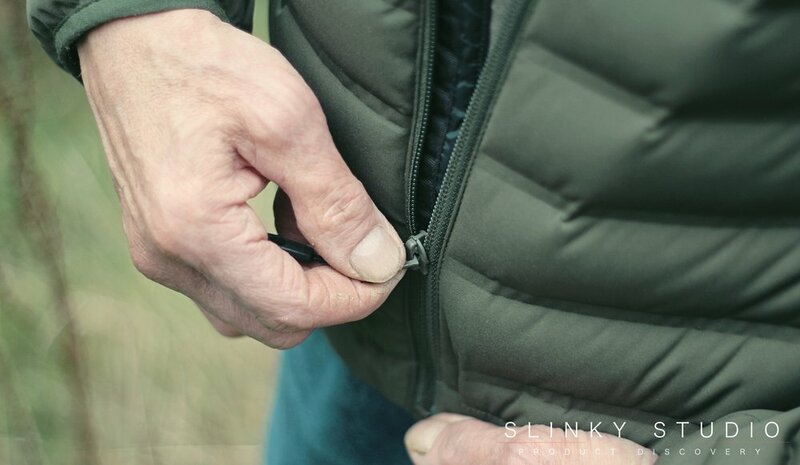 We've found this ability to carry so much within the jacket very useful and are particularly surprised that even with a drinking bottle dropped into the inside pocket the jacket does not appear to become clumsy or misshapen. There's no doubt that this Mountain Hardwear StretchDown insulated jacket will keep us in comfort for many years. Whilst being made to withstand rugged mountaineering and hill walking, it is stylishly good-looking, amazingly lightweight, 'huggingly' warm and extremely weather-resistant.